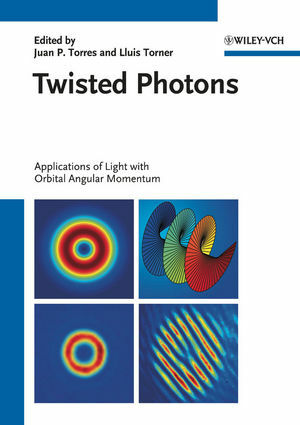 This book deals with applications in several areas of science and technology that make use of light which carries orbital angular momentum. In most practical scenarios, the angular momentum can be decomposed into two independent contributions: the spin angular momentum and the orbital angular momentum. The orbital contribution affords a fundamentally new degree of freedom, with fascinating and wide-spread applications. Unlike spin angular momentum, which is associated with the polarization of light, the orbital angular momentum arises as a consequence of the spatial distribution of the intensity and phase of an optical field, even down to the single photon limit. Researchers have begun to appreciate its implications for our understanding of the ways in which light and matter can interact, and its practical potential in different areas of science and technology. Juan P. Torres is one of the group leaders of ICFO-The Institute of Photonic Sciences in Barcelona, Spain, where he conducts research in nonlinear and quantum optics. He also holds a position as associate professor at the Technical University of Catalonia where he teaches in photonics and electrical engineering. Professor Torres obtained his PhD in Science from the Technical University of Catalonia and afterwards held a post-doctoral position at the University of California at Berkeley. He has authored about 100 articles and received an award for young investigators from the Government of Catalonia in 2002. Lluis Torner is the founding Director of ICFO-The Institute of Photonic Sciences in Barcelona, Spain, and professor of photonics at the Technical University of Catalonia. He conducts research and innovation in photonics, with emphasis on fundamentals and applications of nonlinear optics, optical vortices and optical solitons. He has co-authored more than 300 articles in scienti? c journals. He is a Fellow of the Optical Society of America, the European Optical Society and the European Physical Society, and he currently serves as President of the Association of Research Institutions of Catalonia.